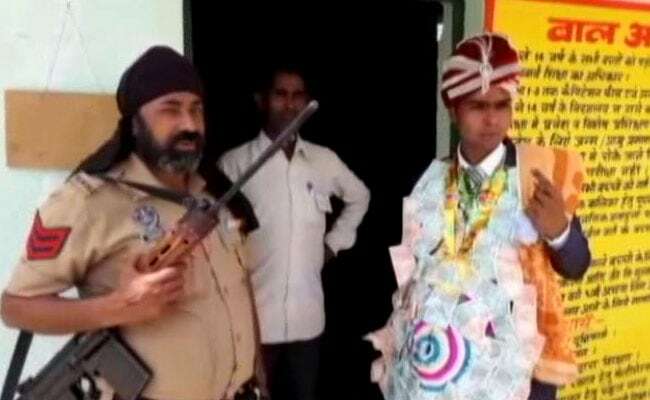 First Phase Of Lok Sabha Elections 2019: The bridegroom, in Uttar Pradesh's Bijnor, joined wedding festivities only after he was done exercising his franchise. A man in Uttar Pradesh attracted a lot of attention when he turned up to cast his vote. The reason: he wore a wedding dress and had a 'baraat' tagging along with him. The bridegroom, in Uttar Pradesh's Bijnor, joined wedding festivities only after he was done exercising his franchise, reported news agency ANI. The first phase of elections was witness to many other such unique instances which highlighted the world's largest democracy in action. In West Bengal, there were instances of elderly women who exercised their franchise, despite their old age. A man carried his elderly father to the election booth in Andhra Pradesh's East Godavari, reported ANI. The administration in Uttar Pradesh's Saharanpur also arranged horse-carriages, wheelchairs and palanquins for the convenience of differently-abled voters. The voters were picked up from their homes and dropped back after they cast their vote, according to ANI. There are 2,929 Divyang voters in our division. We took this initiative so that they could exercise their voting rights freely," said a top administrative official in Saharanpur, according to ANI. Last year, a woman born a century ago had cast her vote during the Chhattisgarh assembly elections. The first phase of the Lok Sabha elections kicked off today. 8 out of Uttar Pradesh's 80 Lok Sabha constituencies cast their vote today, including Bijnor. The other seats which exercised their franchise were Saharanpur, Kairana, Muzaffarnagar, Ghaziabad, Baghpat, Meerut and Gautam Buddha Nagar. The average voter turnout in Uttar Pradesh's eight constituencies was 59.8 per cent. West Bengal recorded the highest number of voters for the first phase, with 80.9 per cent. Tripura, Nagaland, Manipur and Sikkim were also not far behind, with 80 per cent voters turning up. Arunachal Pradesh recorded 79.1 per cent voter turnout and Meghalaya and Mizoram posted figures of around 60 per cent.